London at night is a very different city. 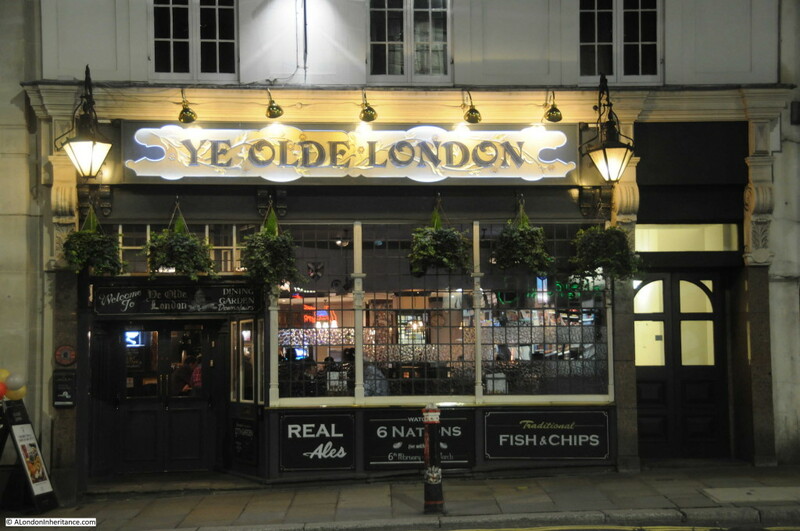 The West End continues to be just as busy as during the day with thousands of people at the theaters, pubs, bars, clubs and restaurants that make this area the entertainment center of London, however head just beyond the West End and London takes on a very different aspect. 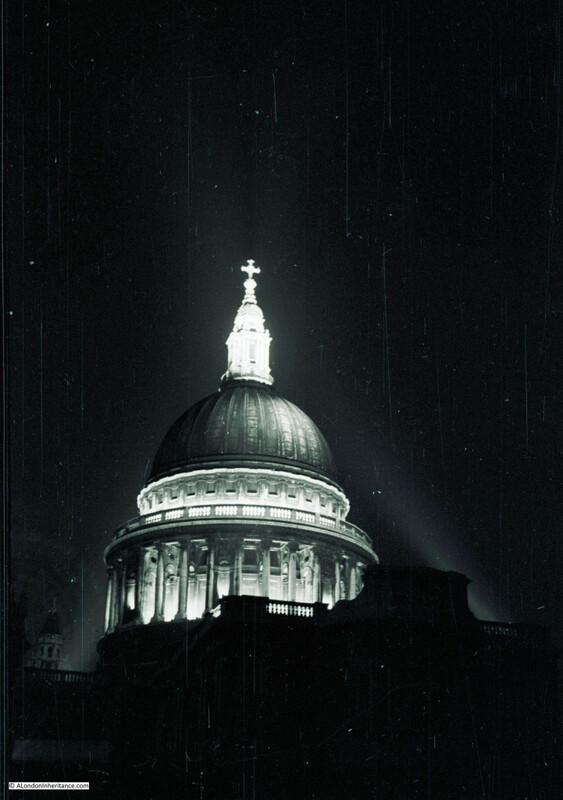 My father took a number of photos in 1951 of the streets at the northern end of Waterloo Bridge, St. Paul’s Cathedral and the Monument. I do not know why he took photos of these locations, he was probably experimenting with nighttime photography which would have been a challenge for an amateur at the time given the camera and film available. To take these, he must have taken a walk from Waterloo Bridge down to the Monument, so I thought I would take a late evening walk along the same route and take some photos of the same locations and more, along the route. I took many more than the five taken in 1951, the cost of film, home developing and printing all limited the number of photos that an amateur would have taken, and really brings home the differences with digital photography today. I wanted to walk the route after the weather had been raining to get the same effect as in my father’s photos, so planned an evening when there should have been a rain shower, however as is typical with trying to forecast the weather, it failed to rain so my full walk of the route was in the dry. The evening before I published this article, it did rain so I headed out again, just to photo the first three locations to get the same effect, the rest of the photos are from my original walk. 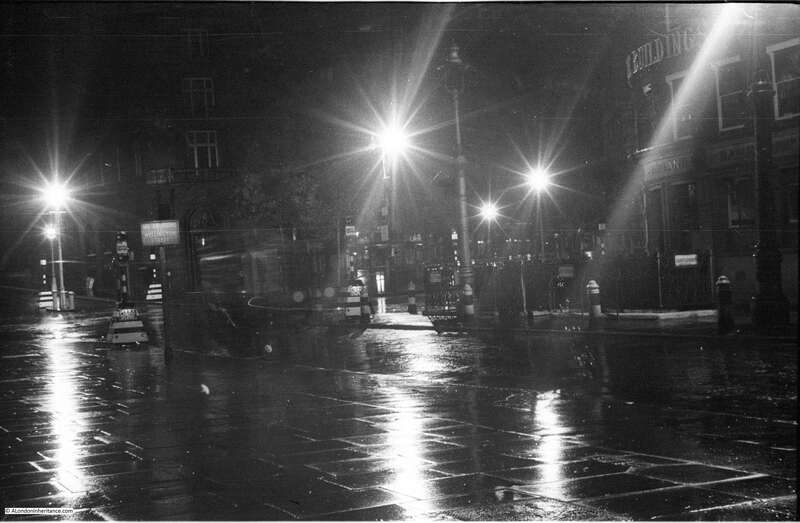 The first location is from the approach road to Waterloo Bridge, looking to where the Strand crosses, the curve of Aldwych to the right, with Wellington Street running up on the left. 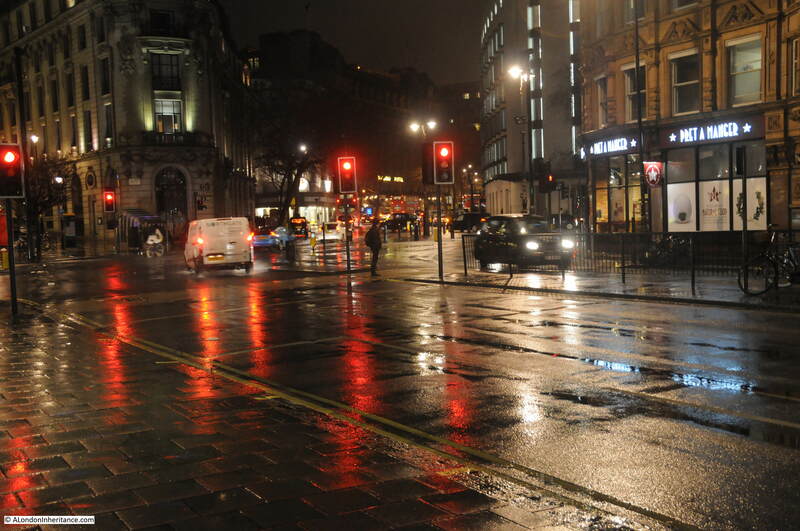 Standing in the same position on a rain and wind-swept evening in February. The building on the right is the same as in my father’s photo, as is the building across the street. 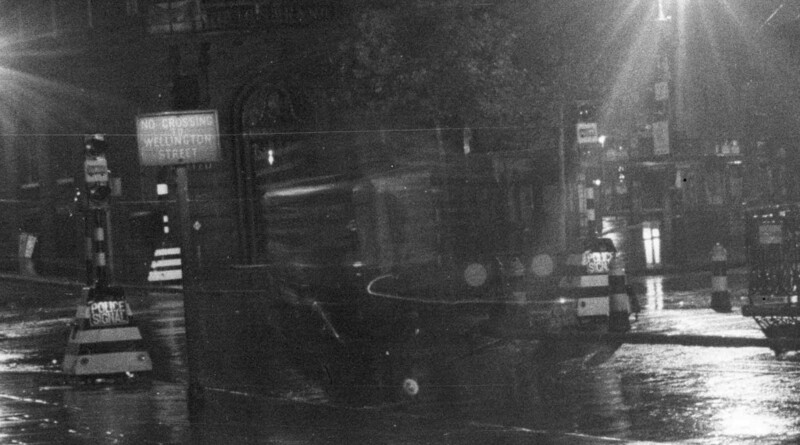 The public toilets that were in the middle of the road have disappeared. 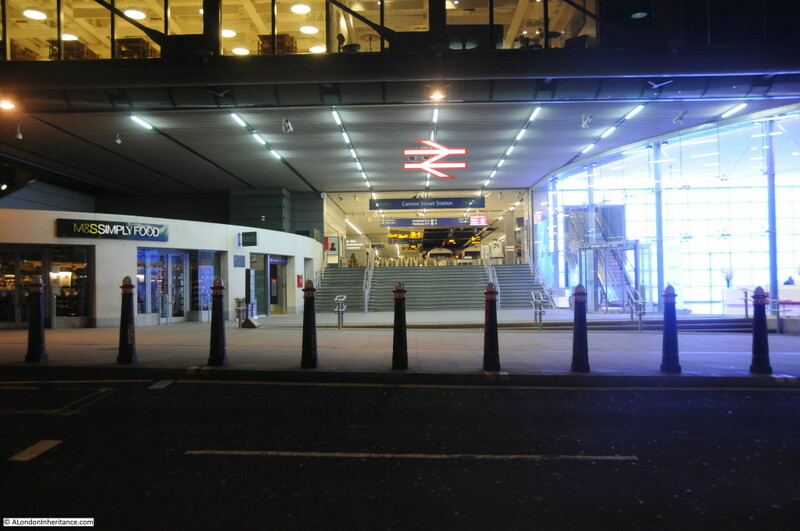 To also check that this is the right location, by enlarging the sign on the post in the original photo, we can see it reads “No crossing to Wellington Street”. Wellington Street is directly opposite the road that leads to Waterloo Bridge and today is blocked off for road traffic from the Strand. It is the location of the Lyceum Theater. The traffic signals appear temporary and are Police Signals, so this may have been some experimentation with traffic and pedestrian control at the end of Waterloo Bridge. 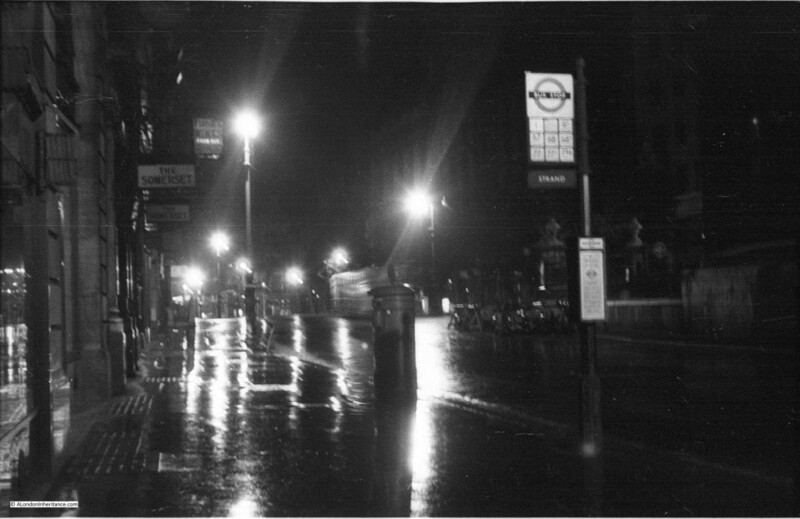 The following photo should have been easy to locate given the bus stop clearly labelled as the Strand stop. 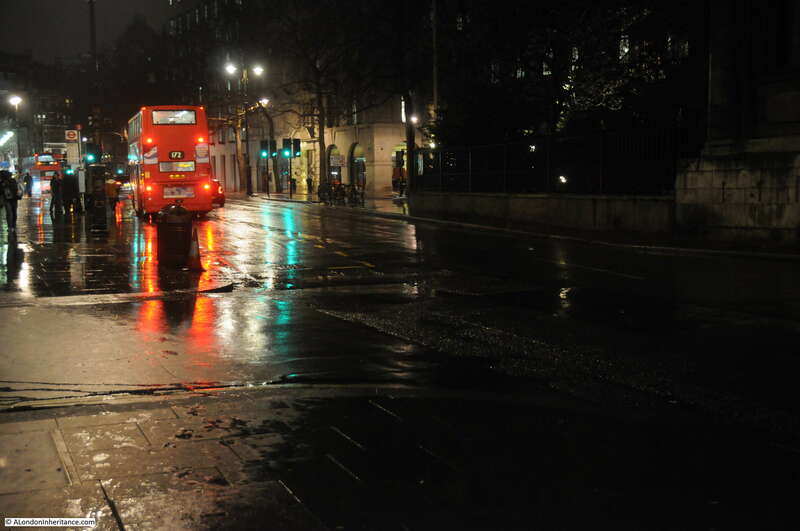 I do not often use the bus in central London, preferring to walk, and was not sure where the Strand stop was located. Walking the length of the Strand, I could not find a stop with this name. What finally helped to locate the position of the photo is the wall on the right side of the photo. This is the wall at the side of the church of St. Mary-le-Strand and is the same in my 2016 photo below. The pillars in the original photo either side of the bus stop sign are still there, they are just hidden in the 2016 photo behind bushes running along the length of the church wall. The bus stop has been moved slightly along the street and the stop is now named “Aldwych”. Where the original bus stop and pillar box were located is now the entrance to the King’s College London, Strand Building. 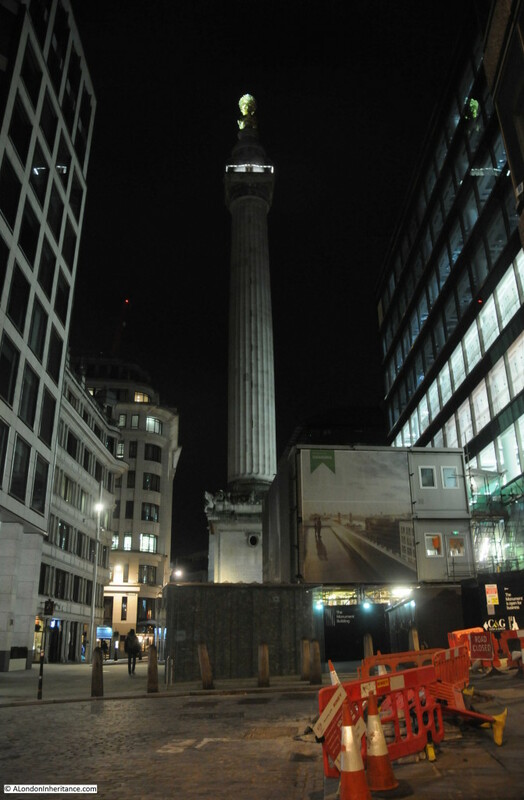 Having found these locations, it was time to walk down to the Monument. 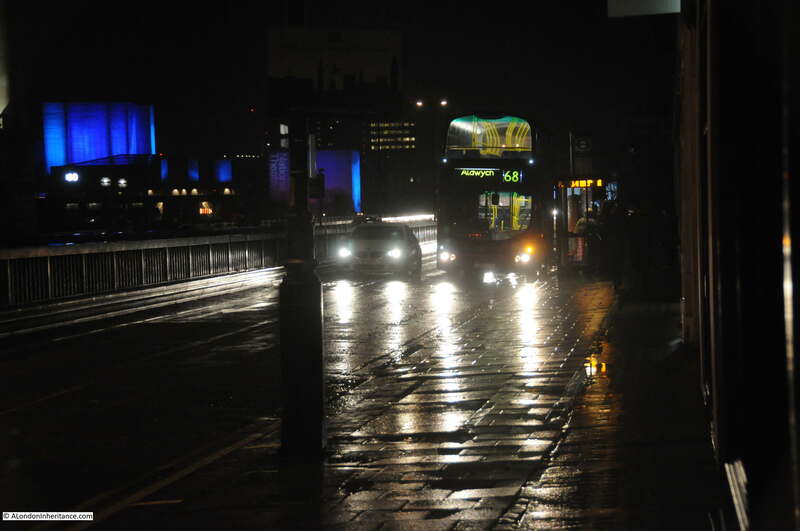 The Waterloo Bridge junction with the Strand seems to be a nighttime boundary. From the end of the bridge turn left and the streets are busy with people, turn right and it is a much quieter street with only a few late night walkers to be seen. 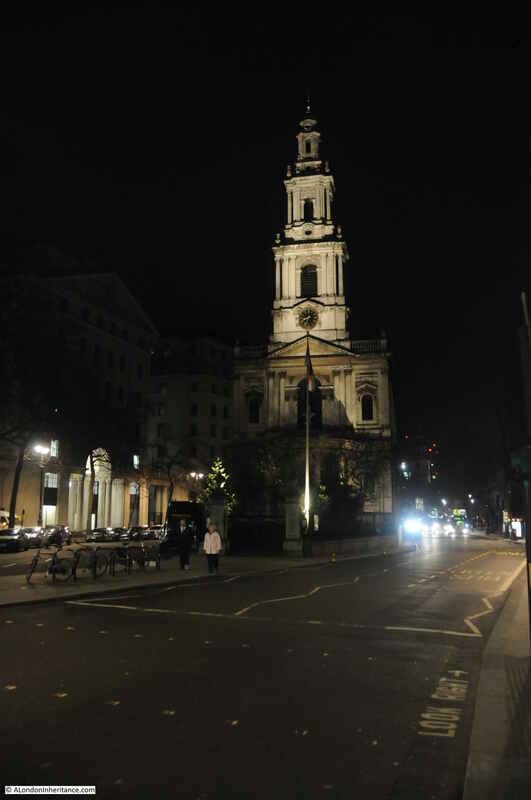 The church of St. Mary-le-Strand. The stone columns at the entrance to the church seen in my father’s photo can just be seen. 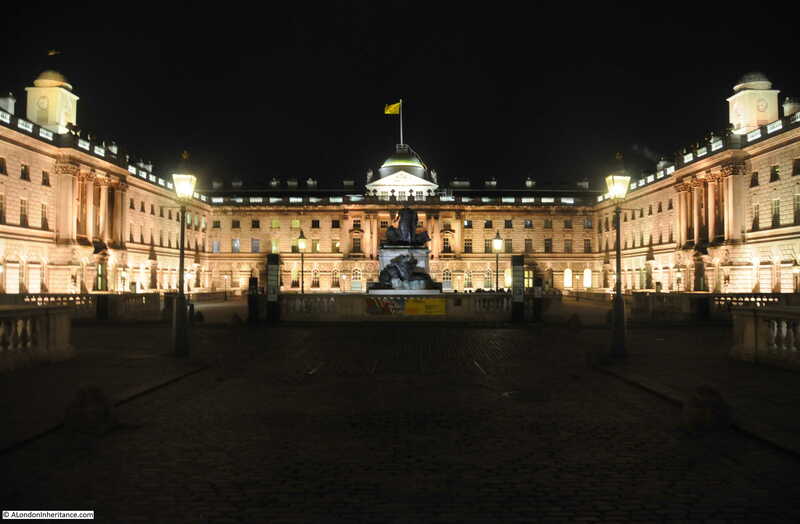 Just a short distance along, turn right off the Strand, through the archway and into the courtyard of Somerset House. 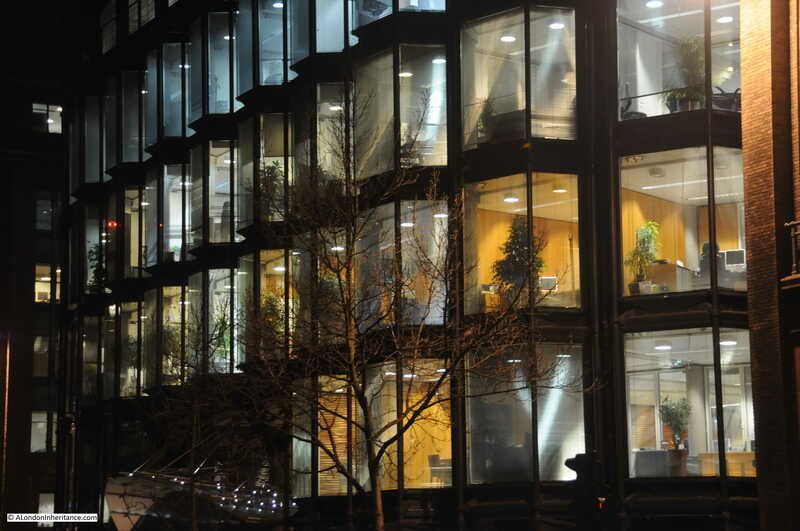 The buildings that surround the courtyard are brilliantly lit at night. 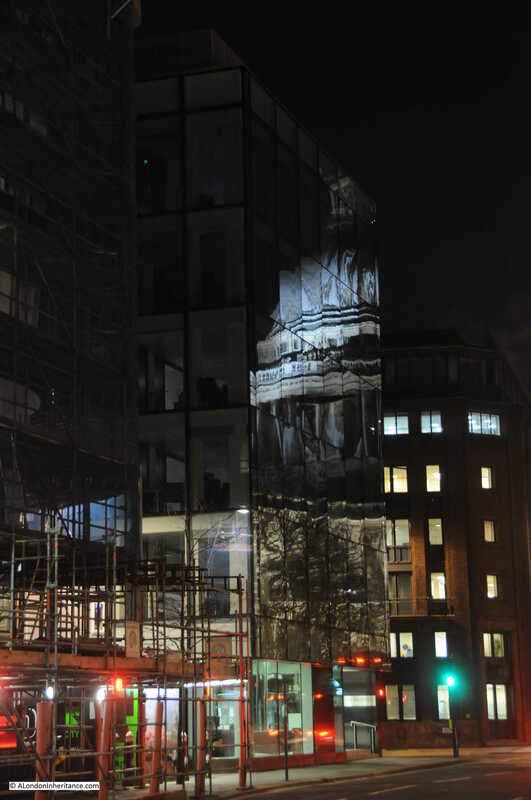 As with many other places across London, there are new buildings being constructed to the south of the Strand adjacent to the church of St. Clement Danes. 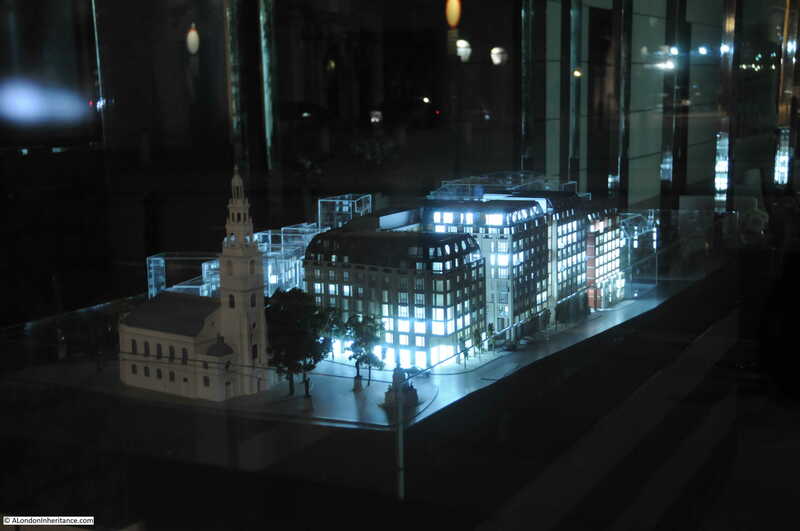 I happened to notice this model of the area and the church lit up in one of the ground floor windows of the new building facing the Strand. The side roads from the Strand down to the Thames show how steeply the land slopes down to the river. 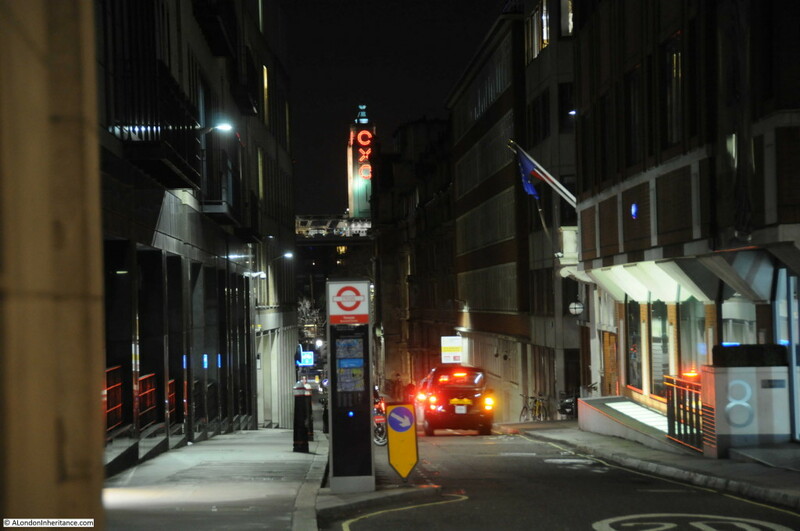 The Oxo Tower on the south bank can be seen along many of these side roads. 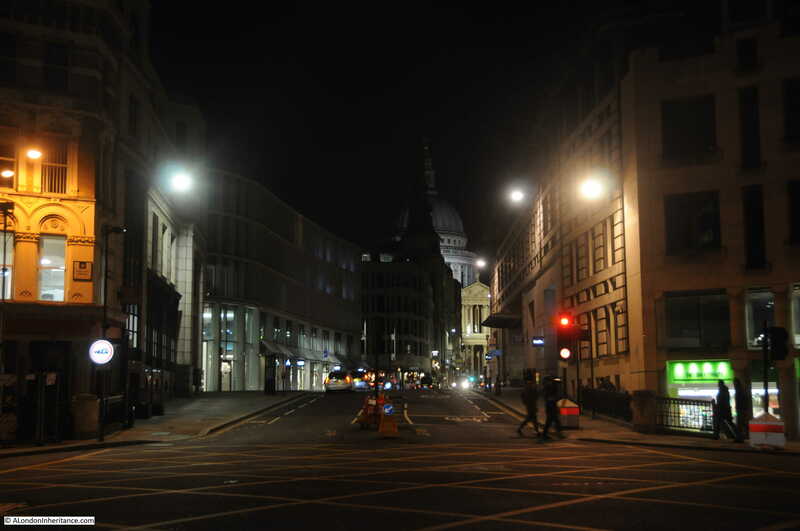 A very quiet junction of Fleet Street, Farringdon Street, New Bridge Street and Ludgate Hill. 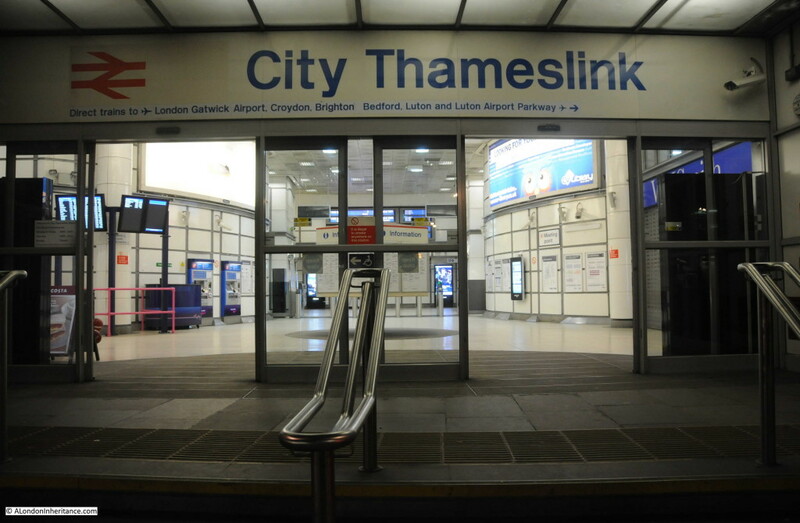 An empty City Thameslink station on Ludgate Hill. 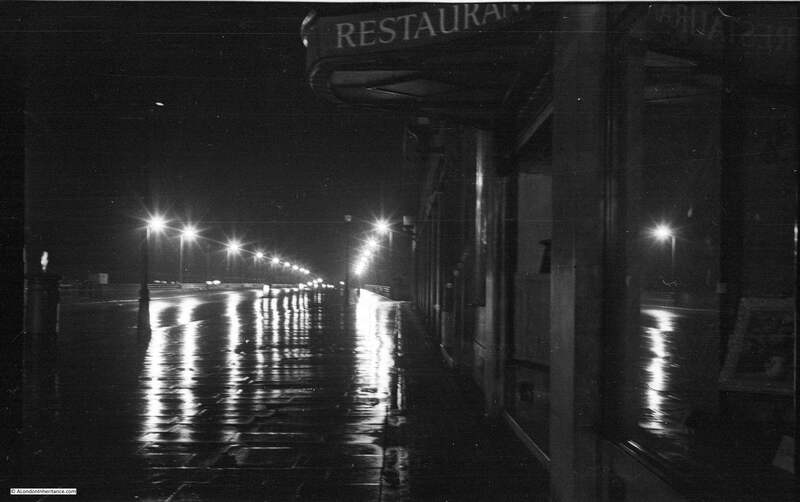 The following is one of my father’s photos from 1951. In the immediate post war period the very top of the Cathedral was lit up by search lights that only a few years earlier had been used to search the sky for enemy aircraft trying to bomb a city that was hiding in the blackout. 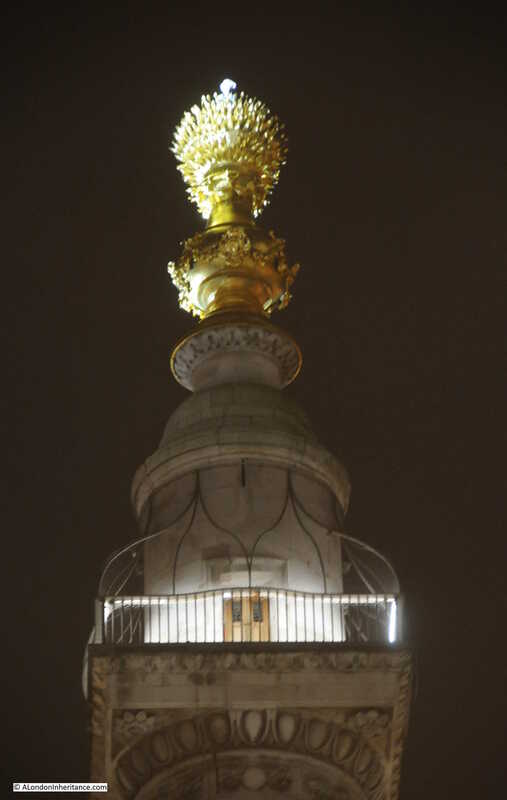 The post war lighting had the effect of highlighting the Golden Gallery, the Lantern and Cross. 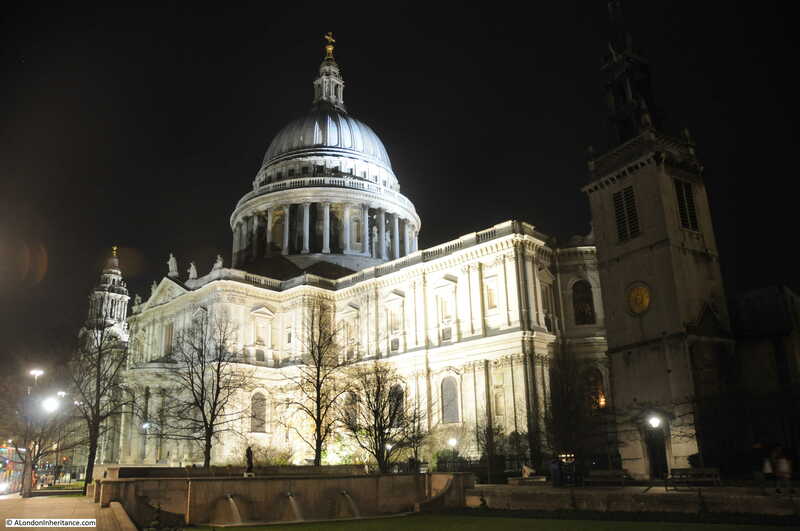 Today, the whole of the cathedral is illuminated. 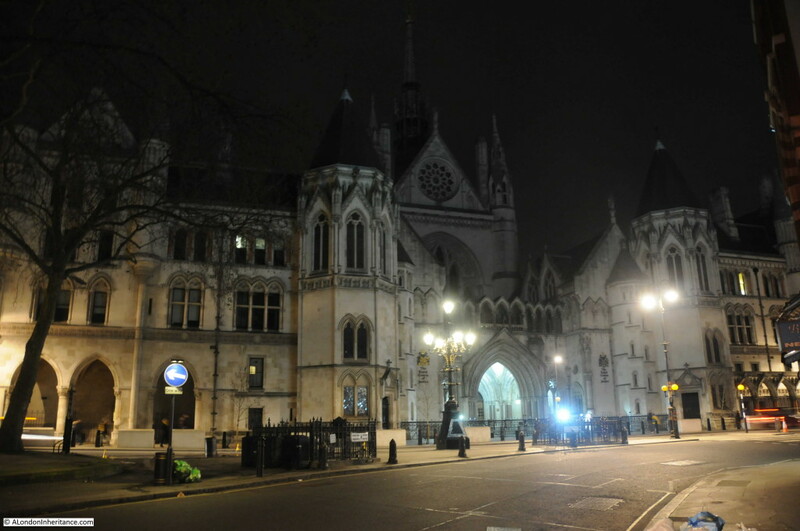 The above photo was taken from a point on the land now occupied by One New Change. 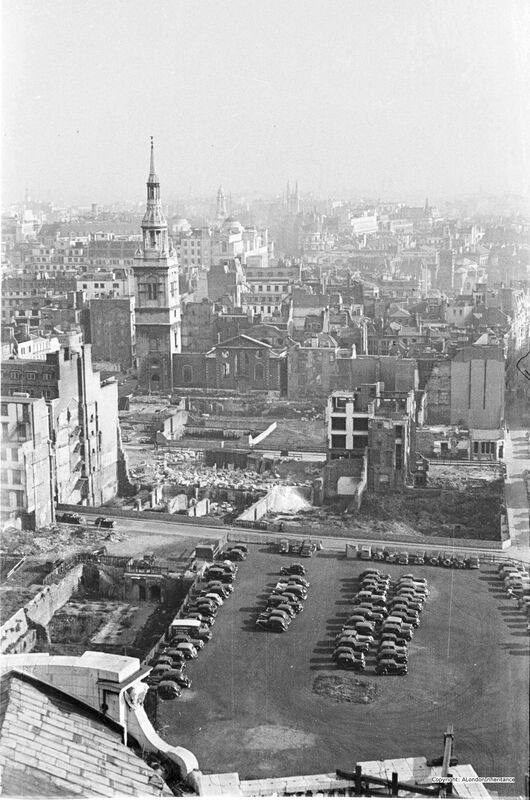 At the time, this was still empty land having been cleared of all the bomb damaged buildings. I could not get far enough back to take a photo from the same position so the following photo is the nearest I could get. 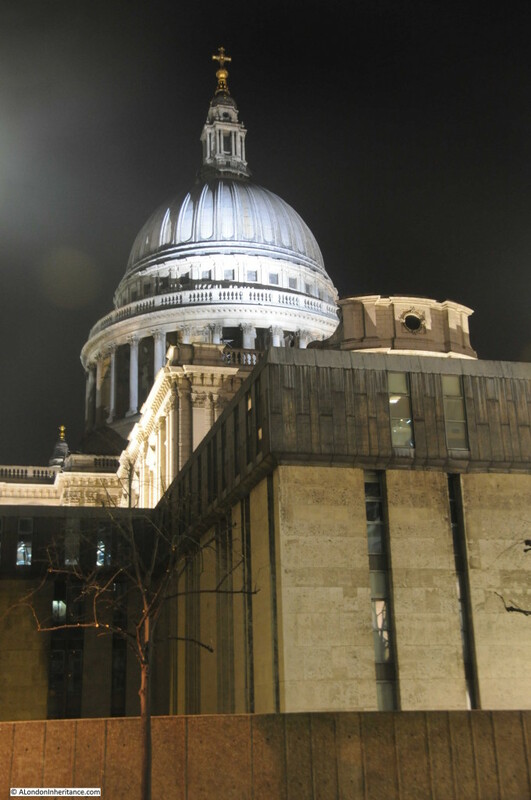 The base of the Cathedral is also obscured by the post war buildings that house the Cathedral School. 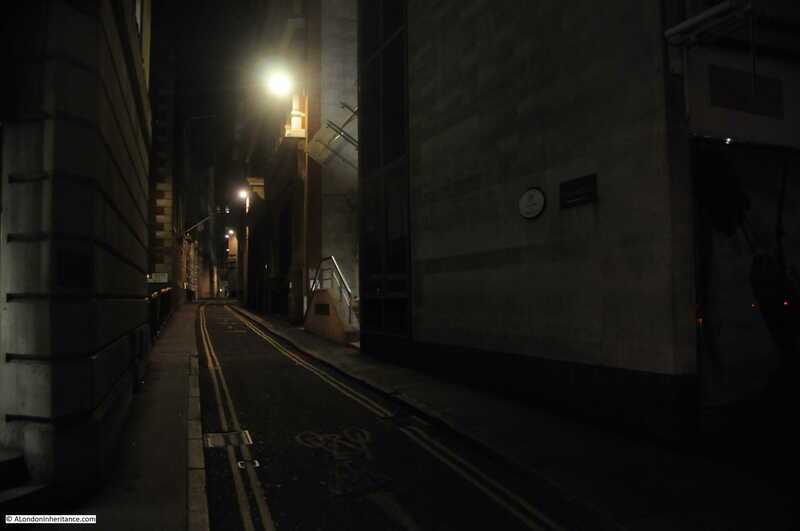 The next photo is of Abchurch Lane, leading up to the church of St. Mary Abchurch in the heart of the City. Very busy during the day, however I stood here for about 10 minutes and did not see a single person along the length of the lane. It is in these alleys and lanes across the city that it is possible to imagine a much earlier London. Many more people would have lived in the City, but long after dark what reason would there be for people with legitimate business to be walking the streets? 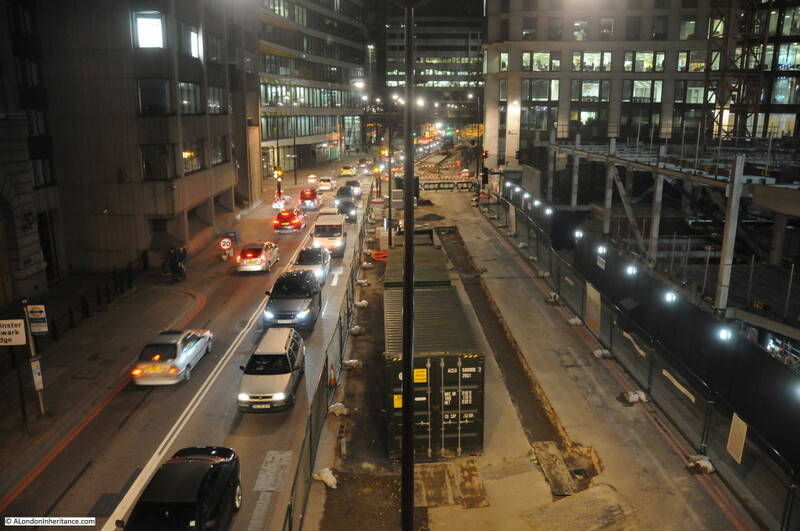 Back to the 21st century and the junction of Cannon Street with King William Street. Walking across the City at night, I find that there are very few people walking, but the main streets through the City are always busy with traffic. Walking down King William Street and a quick look over at Upper Thames Street. 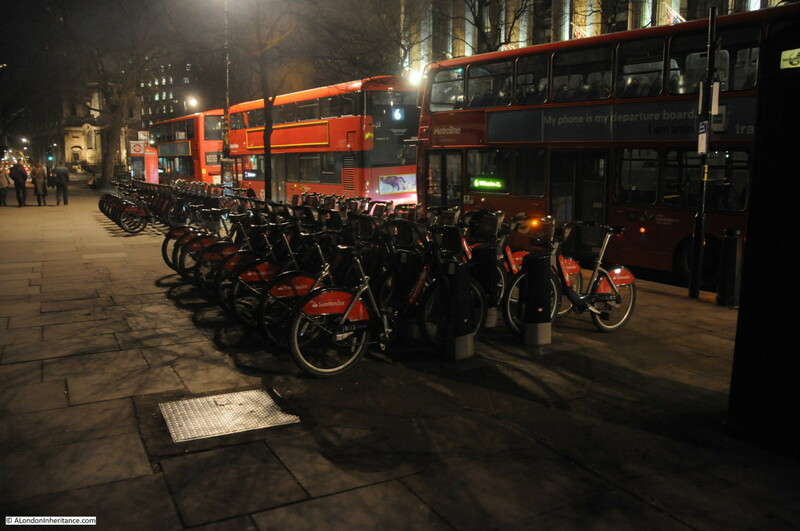 Roadworks for the Cycle Superhighway have closed one of the carriageways leading to queues of traffic long into the night. Upper and Lower Thames Streets form the southern route taking traffic east – west through the City. The roads were widened post war rather than build the Embankment extension which was one of the options put forward in the plan for post war reconstruction of the City (see last weeks post). 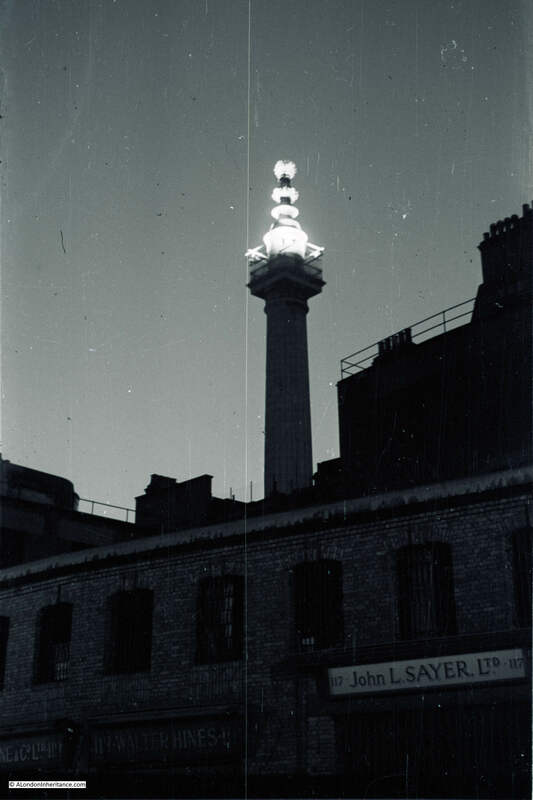 The next photo is my father’s photo of the Monument in 1951. I can place where the photo was taken from by looking at the position of the viewing gallery, the photo was looking up at the Monument and the glow in the background is from the searchlights on St. Paul’s. It was taken from Lower Thames Street prior to the widening of the road and the new buildings which have now obscured the view. As I could not get a photo of the Monument from the same position due to the height of the buildings between the Monument and Lower Thames Street, this is the Monument from Monument Street with typical London building work on the right. Advertising for the new office building shows the view from the roof with office workers on the roof apparently able to look straight across to the tourists on the viewing gallery of the Monument. It would have been much darker in 1951 when my father took the same route to photograph the Strand junction, St. Paul’s Cathedral and the Monument which is probably why he did not take any photos between these locations, however walking London at night is still a very different experience to the day. 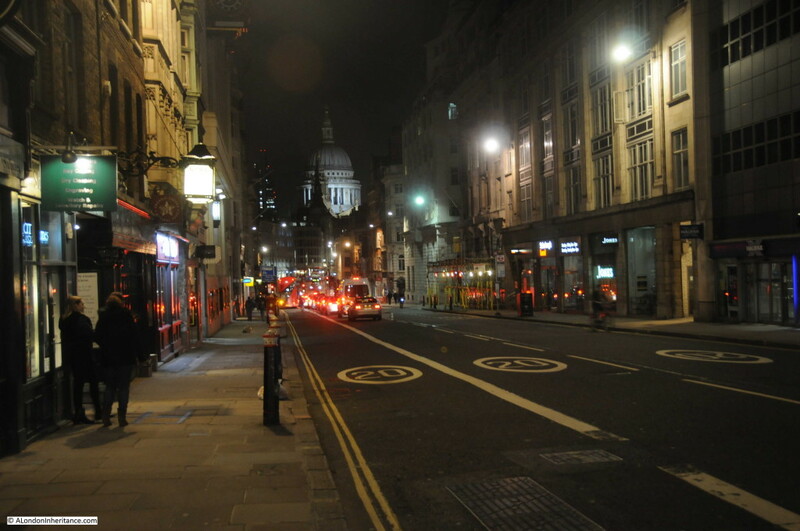 The Strand and Ludgate Hill are relatively quiet compared to the day, but turn off the main streets through the City, away from the traffic and you can walk the lanes and alleys, often without seeing another person. 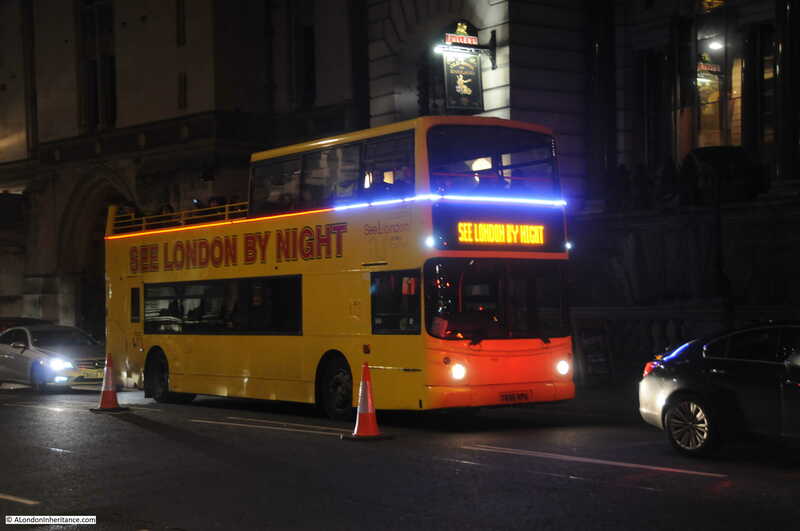 It is here that you can let your imagination run over the last two thousand years of London’s history and imagine who has walked and what has happened in this nighttime City. 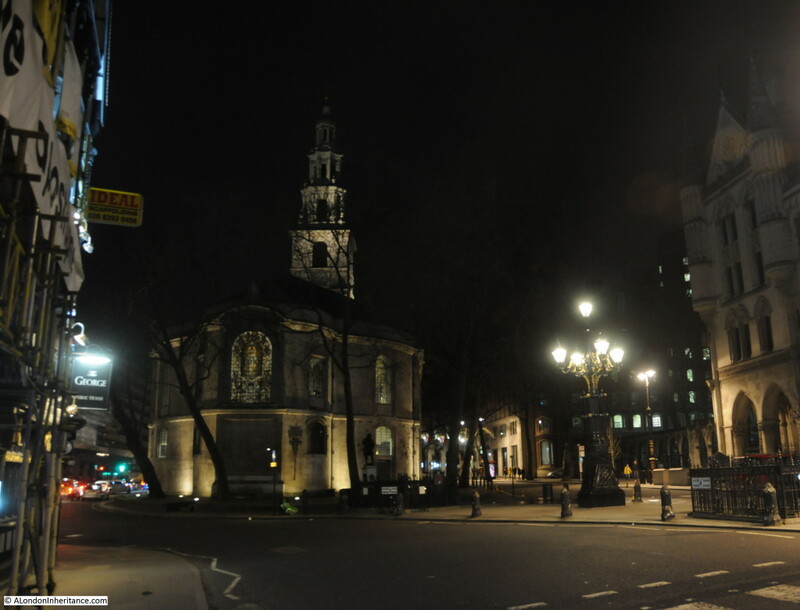 This entry was posted in London Streets and tagged London at night, St. Clement Danes, Strand, Waterloo Bridge on February 7, 2016 by admin. A fascinating read, as always,Admin. My Dad was very interested in photography, cluttering the kitchen with developing and enlarging equipment,much to Mum’s annoyance. I don’t know if he took many photos of places so much as family and friends. I just wish now that my parents hadn’t been so vigorous in their ‘downsizing’ when we children left home. Some photos remain with us,but,not nearly enough. How lucky you are to have your father’s collections! Wonderful photos again; I especially liked the one with the reflection of St. Paul’s in the office windows. Another wonderful post. 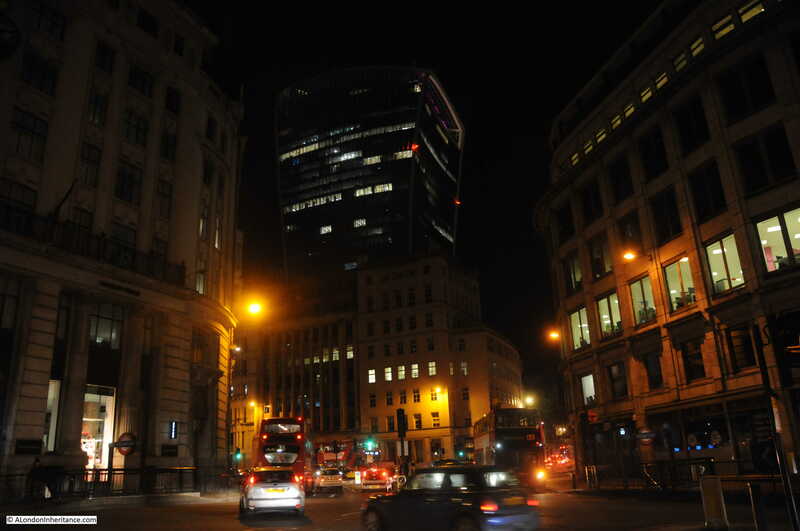 I regularly walk around in The City at night. 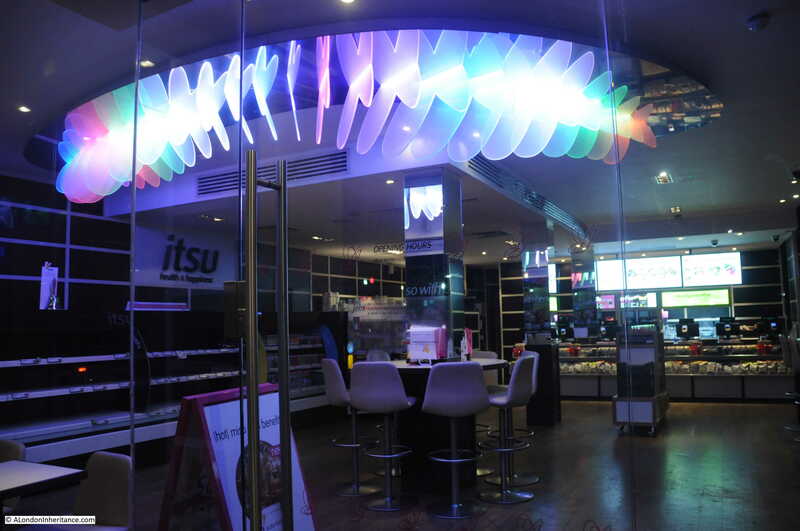 I love the look of The City at night (bright lights, empty shops). I also enjoy a good City walk on a Sunday, exploring the alleys and the nooks and crannies. It’s fun to imagine what it was like centuries ago. Thanks to you, and to your dad, for the fantastic pictures. another careful and loving post, with both yours and your father’s photos to be savoured. Thank you. Thank you for all the wonderful photos by you and your father. A great post!